Publication of the Minutes of the Parish Council Meetings held on 29th September, 2011 and 27th October, 2011 have been delayed until now. This was because these were not approved by the council as they were being formalised. The Clerk apologised for the lateness of the preparation of these due to pressure of work in recent weeks. These Minutes together with the latest approved Minutes of 24th November 2011 are now all available. Click Here. 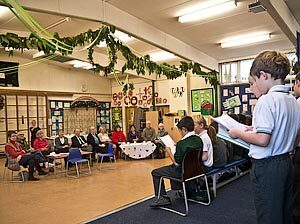 Yesterday morning was a particularly busy one at Theydon Bois Primary School. The day started with a much longer than usual pre Christmas assembly where the awards were made to pupils for outstanding achievement and competition prizes and certificates were handed out. 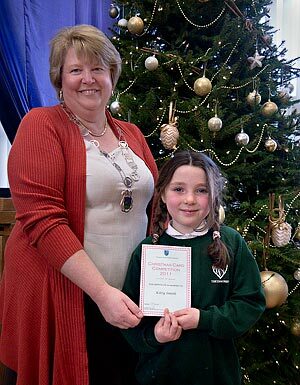 This included the award presented by Parish Council Chairman, Sue Jones to Kitty Smith who was the overall winner in this years Parish Council Christmas Card Competition. 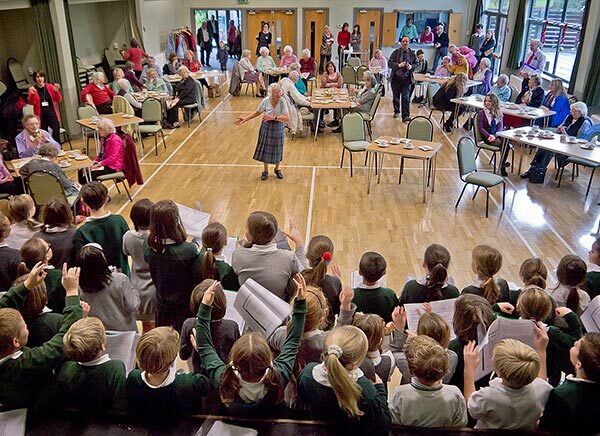 This was followed at 10.30am by a Special Christmas Coffee Morning for our village seniors where they enjoyed tea, coffee or a glass of mulled wine together with mince pies and biscuits while being entertained by the school choir singing carols and Christmas songs. The singing was as usual to a very high standard with some very good solo performances. Head Mistress Elspeth Bonds described the hard work all the choir members put in. Each member gives up 45 minutes of their lunch break on 3 days each week. The Choir is going from strength to strength and has some major collaborative events in the planning stage for next Easter. 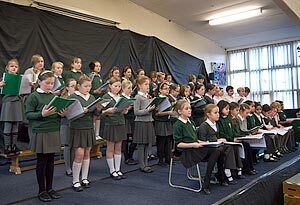 At the end of a very enjoyable morning Essex County Councillor Janet Whitehouse thanked the Choir, School Teachers and Staff for all their efforts on behalf of all the audience and said they were all looking forward to attending again next year. As well as the over 65's and under 65's "At Risk" groups the NHS is concerned over the low flu jab uptake among pregnant women. Pregnant women are being urged to have their free flu jab after figures revealed the current uptake across north Essex is worryingly low. It is only since 2009 that pregnant women have been recommended to receive the vaccine, when they were added to the over-65s and under-65s in certain ‘at risk’ groups as people entitled to a free jab. Theydon Bois Parish Council intend Replacement/Upgrade of the Village CCTV System and associated Maintenance Contract. The council invites Contractors wishing to Tender for this work to contact The Parish Clerk before 12 noon on Thursday 5th January 2012. 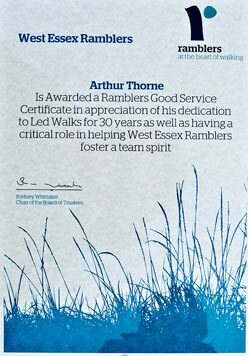 Barn Mead echoed to the sound of walking canes and boots today as over 30 members of West Essex Ramblers turned out to Honour Arthur Thorne. 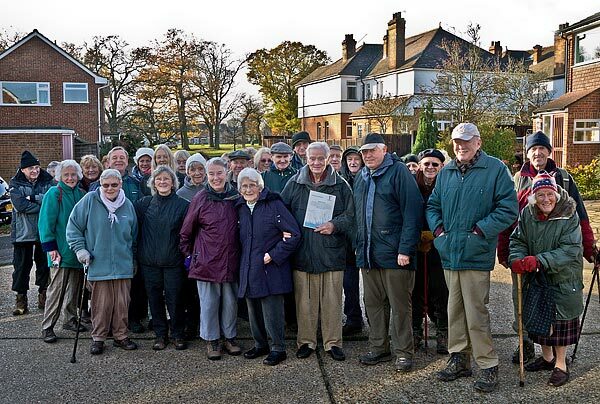 Arthur (82), usually accompanied by his wife Joyce (81), has been leading Ramblers walks from the Theydon Bois Avenue of Trees on the 1st Tuesday of every month for 30 years and was the first person to persuaded the Ramblers Association to run some additional shorter walks of 3 - 4 miles only that could be completed in a morning. No matter what the weather conditions Arthur was always there to guide a walk, which usually had 30 plus people following. 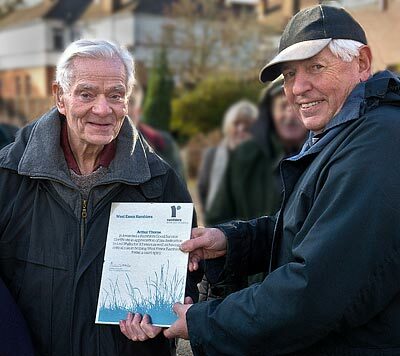 The Ramblers Association has awarded Arthur one of it's rarely issued Certificates in recognition of his services to the promotion of Walking in the Community. As Arthur is now not well enough to walk regularly the presentation was made to him outside his home in Barn Mead by John Francis. 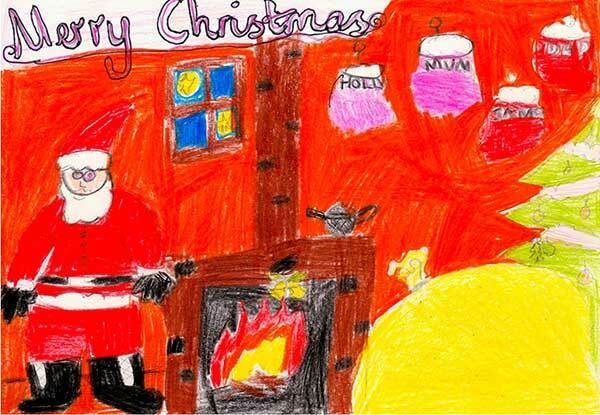 The winner in this years Christmas Card Competition for the pupils of Theydon Bois Primary School run by the Parish Council in conjunction with Theydon Newsdesk was Kitty Smith of class 3/4F. Again this year it was a very close contest making it difficult for the judges. All the winners and runners up can be seen in our Gallery of Cards with Winners Names here. The start of this Christmas season has seen some excellent opportunities for us to purchase our Christmas presents for loved ones without even leaving the village. 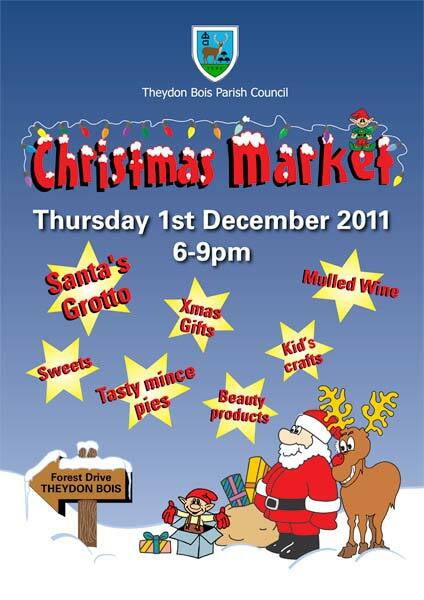 St. Mary's Church Fayre and Theydon Bois Primary School PTA Fayre were both held on Saturday 26th December and then last Thursday evening, 1st December, we held our first Community Christmas Market in the village. 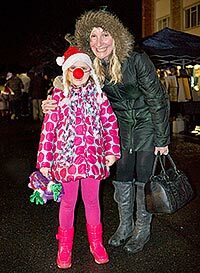 After much discussion the Parish Council decided to move away from our traditional tree lighting ceremony and hold a Christmas Market in the village centre. They hoped to encourage people from all sectors of our community to join the event and to give local traders an opportunity to promote their businesses. 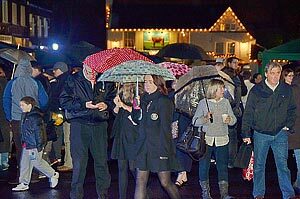 Despite the heavy rain it was a very successful evening. We also very pleased to say that, thanks to Chris Jones and his helpers from the Village Association, the Christmas Tree in the grounds of the Village Hall has still been decorated and now provides a welcoming Christmas backdrop as you drive through the village. 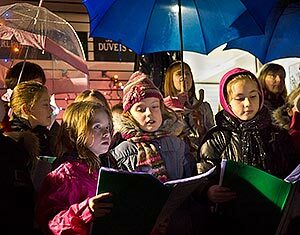 The choir from the Primary school opened the event by singing a selection of Christmas songs, huddled under umbrellas gallantly held by their teachers. Unfortunately, as always, the one aspect of the evening that can never be organised in advance was the weather. 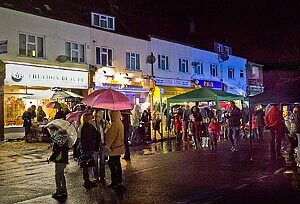 Members of the Parish Council’s Community Liaison Committee oversaw the event, but it was supported by every Councillor and all the shopkeepers. 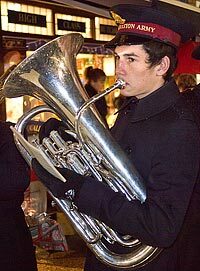 We are very grateful to the members of the Salvation Army who came along to play carols as people browsed the stalls. Many children visited Santa in his grotto during the evening. Despite all the rain the evening went extremely well and has certainly steered us in the right direction for future events. 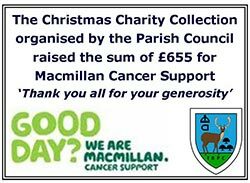 The event and the following Saturday street collection raised a total of £655 for MacMillan Cancer Support. Again thank you to all those who turned out to support the event and make it such a happy occasion. 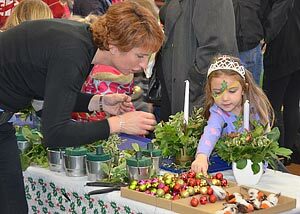 There are more photos of the Christmas Market in the Photo Gallery here. 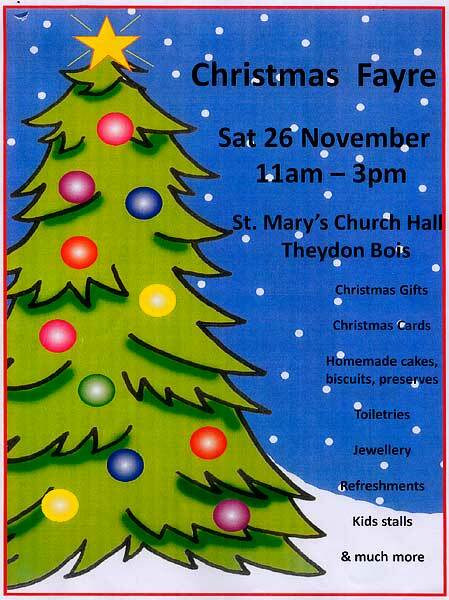 St. Mary's will be holding a table top sale at the Church Hall on Saturday 28th January from 11am-3pm. Tables can be hired, by individuals or groups, for £15 per table and must be booked in advance. You can use your table to sell unwanted Christmas gifts or anything you like (within reason!) and all income is kept by the stallholder. Entry will be 50p and refreshments will be served. Please contact Marion Oliver on 01992 812042 to book a table or for further details. 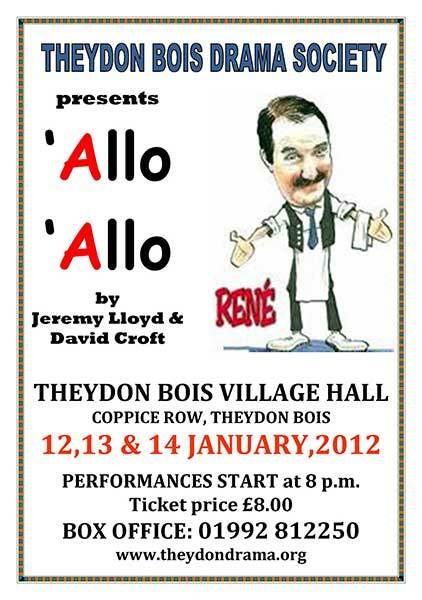 Are you a Theydon Senior? If so you and your friends are warmly invited to attend our annual Senior Citizens Christmas Morning which will be taking place Wednesday, 14th December 2011 from 10.30 am until 11.30 am in the school hall. 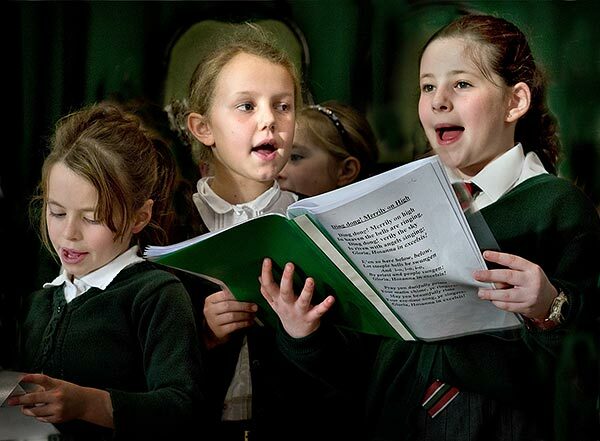 As well as tea, coffee, mulled wine and mince pies to enjoy, entertainment will be provided by the school choir who will be singing seasonal carols and songs. It would be helpful if you could let us know if you can attend and how many guests you would like to bring – the more the merrier! 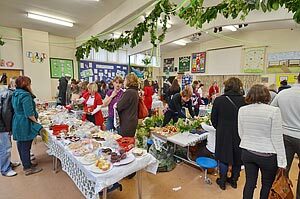 Following the successful fireworks display, Theydon Bois Primary School PTA held a very successful Christmas Fair at the school on Saturday 26th November 2011. 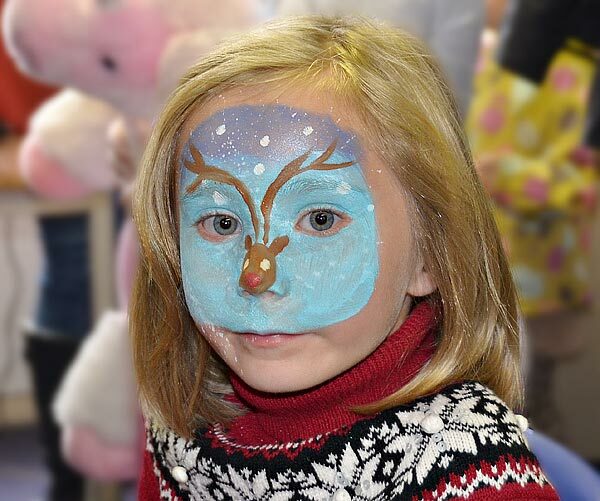 There were stalls a-plenty and the children enjoyed themselves going into Santa's Grotto, hair and face painting, making your own cocktail with mini parasol (non-alcoholic of course! and decorate your own biscuits with lots of lovely goo. A long queue formed for the Jarbola competition which was an opportunity to win decorated jars which the children had previously filled with tasty goodies. There were many other items to excite the taste buds, especially the enormous variety of home-made cakes. 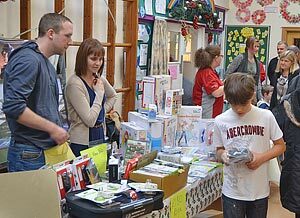 A teddy tombola stall did good business as did the stalls selling loads of recycled games, toys, books Christmas decorations and cards at knock-down prices. 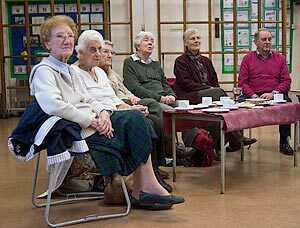 At times it was hard to tell who were the "youngest at heart" and who were enjoying themselves the most at the Parish Council Event for our Village Seniors held yesterday. 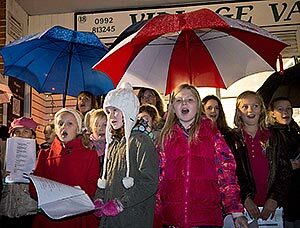 The bubbly and enthusiastic 'youngest youngsters' of the Theydon Bois Primary School Choir sang a selection of Christmas songs and carols that contributed a rousing and seasonal start to the event. Some of our seniors were soon joining in. 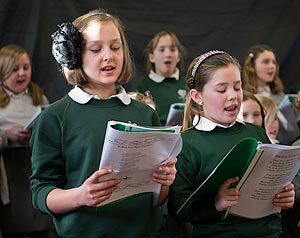 The school clearly has some really talented very young singers and three of them sang difficult solos at the event. 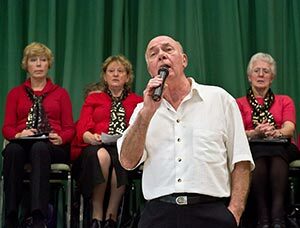 The 'Youngsters' of all ages that form the 'Singing 4 Fun' choir from Epping Forest U3A were up next and they and their male soloist Patrick entertained the Seniors with a variety of well known musical items. No longer feeling their age some of our 'Young Seniors' considered all of this music an invitation to trip the "light fantastic" around the tables in the hall. 'Strictly' has nothing on offer compared to seeing some our Seniors in full flight! Melissa Wood from the Davenant Foundation School took an impromptu solo on the carol Silent Night and you could hear "a pin drop" as all present listened attentively to her performance. A number of Davenant's senior pupils, including Ellie Bedwell this web site's Youth Editor, had turned up to help out at the event and it was good to see them all visibly enjoying themselves, greeting and chatting with our seniors, as well as taking time to serve them the tea, cakes and festive mince pies. These had mainly been home made by the Parish Councillors and villager volunteers for the afternoon. As usual everyone of them also put in a lot more effort behind the scenes to ensure the event ran smoothly. As 4.00pm drew round and their transport awaited our Seniors seemed reluctant to leave. Thanking the Councillors present they said "What a great afternoon we have had. It takes you back to your earlier years and with all these lovely young people around it makes you feel Younger than Ever". Ellie Bedwell's Youth Page article on the event is here. There are more photos of our Seniors Event in the Photo Gallery here. Over recent weeks there has been an increase in burglaries, particularly in the Epping District. Incidents have taken place overnight and during the daytime. Various methods of entry have included forcing front doors, back doors and smashing back windows. Premises targeted are generally semi-detached or end of terrace, with easy access to the rear. Flats are also being targeted. Hotspots include Buckhurst Hill, Chigwell, Loughton and Debden. Please be aware that other areas may also be targeted by offenders in their efforts to avoid detection. Also over the past few weeks Epping District has seen an increase in thefts from motor vehicles. Incidents have mainly taken place overnight. Items stolen include Sat Navs, Laptops, other small electrical items and personal property. A number of Index plates have been stolen and spare wheels have also been taken from underneath vehicles (this includes incidents in the Harlow area), particularly Transit vans. There is no particular hot-spot; incidents are occurring all over the Divisions. The purpose of this article is to make you all aware of the problems and ask everyone to report any suspicious behaviour to police by dialing 999. Your ‘eyes and ears’ are a valuable part of helping us to catch the culprits or deter them. For ideas on crime prevention and how you can better secure your property visit the Essex Police web-site – www.essex.police.uk - and click on the ‘Be Safe’ tag. Alternatively contact your local Crime Reduction Officer on 101 (Emma Clark at BRENTWOOD Ext 320384, Tony Ellis at EPPING Ext 319383, Graham Anthony at HARLOW Ext 300383). Please note the following closures / revised opening times as appropriate, which will take effect from Monday 28th November 2011. EPPING FRONT COUNTER: OPEN between 12 midday and 6pm Monday to Saturday. Closed Sundays and Bank Holidays. LOUGHTON FRONT COUNTER: OPEN between 12 midday and 6pm Monday to Saturday. Closed Sundays and Bank Holidays. BRENTWOOD FRONT COUNTER: OPEN between 12 midday and 6pm Monday to Saturday. Closed Sundays and Bank Holidays. HARLOW FRONT COUNTER: OPEN 8am to 12 midnight Seven days per week. Neighbourhood Policing Teams will continue to operate from the Police Stations. Below is the updated programme of speakers at the Men's Forum for the remainder of 2011 through to June 2012. They meet at the Theydon Bois Baptist Church (Rear Halls), The Green, at about 10.15 am and finish at 12 noon on Wednesdays. Andy from the Flower Yard (a Theydon Newsdesk Sponsor) based in Loughton Lane has agreed to give all readers of Village News and the Village Website 10% off everything he has in stock for Christmas, including Christmas Trees. 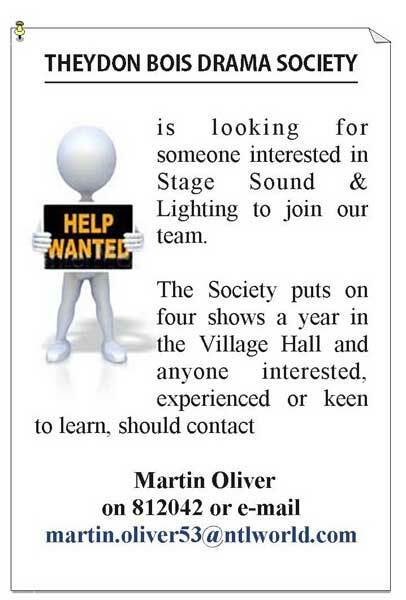 Just mention you saw it here on the Village Website or take along the ad that will appear in Decembers Village News. 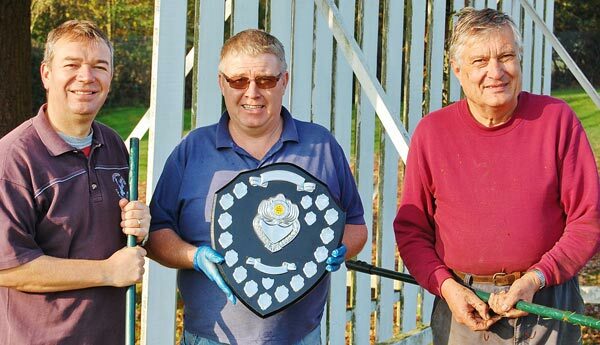 Pictured L - R are Warren, Matt and Paul with the EPFA shield. The Buxton Trust have won the top award at the Essex Playing Field Association's 'Best Kept Playing Field' presentation evening. It is the first time in many years the Trust has won this award, although they have done well in a lower category in recent years. The award is just reward for the hard work put in by Chris Innerd, Matt O'Reilly, Warren Hyde, Paul Argent and Oli Micheli to keep the playing fields in a fabulous condition. One issue that is concerning the Trust at the moment is that one or two dog owners are letting their dogs foul the playing fields and not clearing up afterwards. Given the fields are used by children and adults all year for their sports this is unacceptable, and the Trust would ask all dog owners not to exercise their dogs on the playing field. The Churchyard at St Mary’s Church is basically a large garden with a number of attractive features including a Lich Gate in Coppice Row and a smaller Iron Gate providing access to a wooded footpath leading up to the Church. It is ideal for quiet contemplation and the opportunity to wander through, and appreciate, part of the natural world in which the Village is located. The Churchyard is kept in good order by a team of volunteers but more help was now needed so the Church was appealing for people to join the team and help preserve this small haven of peace. We follow the adventures of René, the hapless owner of a café in war torn occupied France, as he and his wife, Edith, struggle to keep for themselves a priceless portrait stolen by the Nazis, and kept in a sausage in their cellar. René is hiding a British officer, and is endeavouring to repatriate him with the assistance of the Resistance. However, communications with London are somewhat limited. Matters come to a head when news filters through that Hitler is to visit the town. The café becomes filled with tricksters intending to impersonate Hitler, before the event. René will require all the wit he can muster to save his café and his life. Theydon Bois Primary School has just launched it's new stand alone web site after many months in development. Previously the school sub-site was edited and hosted by the Village Website, but the new site directly under their own control and editorship will enable them to more readily up date parents and villagers. The new site URL is: www.theydonbois.essex.sch.uk/ but it can still be reached by the links on the Village Website Home Page . Head teacher Elspeth Bonds said: "So much good news is being created at Theydon Bois Primary School thanks to the hard work of the staff and our pupils. "Because of this we are keen to highlight what we are doing. We hope that many of our parents, their friends and families as well as villagers and businesses in and around Theydon Bois will take a regular look at our new website and also register with our email service to receive our updates on the school's activities." The school now has an email service to keep people informed about its news and events. Anyone can register to receive its media releases to keep them up-to-date with the school's achievements in the classroom and in the community. The email service - is available free of charge to subscribers who can ask to have their email address removed at any time. No email addresses are passed to a third party. Village Montessori Nursery News - After much anticipation, finally on 13 October two inspectors from Ofsted arrived unannounced to carry out our inspection. The inspection was carried out professionally and pleasantly, much to our relief and satisfaction, and the overall quality of the Village Montessori Nursery has been judged as “Good”. The inspectors commented on our strong teamwork, the warm welcoming environment, and observed that the children were very happy and engaged at the setting. The inspectors thanked us for a lovely day! We are naturally delighted with our judgment and now look forward to renewing our Montessori accreditation early next year. The Ofsted Inspection report can be found on the Ofsted Website at www.ofsted.gov.uk/inspection-reports/find-inspection-report. Nr Epping, Essex CM16 7ER. Close to M25 J26 and M11 J5. The Parish Council is leading the sponsorship for a special village day to celebrate the Queen's Diamond Jubilee next year and a special committee of residents has been set up to organise the event. 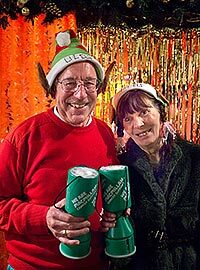 The committee is very much looking for further sponsorship from other village organisations. It will be held on Monday 4th June 2012 and all villagers are invited.The event will be staged in the grounds of the Village Primary School. It will start at 2pm and will finish at 11pm. Events will include bands, dance groups, singers, musicians and disco and there will be games for the children. There will also be a 'lighting of the beacon' ceremony at 10pm. Admission will be free and refreshments such as hog roast, BBQ, Paella, ice cream and beer can be purchased but villagers are welcome to bring their own drinks and picnics as well as their own gazebos and seating. Theydon Bois Horticultural Society has highlighted advice from an article in The Royal Horticultural Society’s magazine after villagers reported problems with their busy lizzies this year. No fungicide is available to home gardeners for impatiens downy mildew and as the infected plants can leave resting spores in the soil it is essential to be rid of all infected plant material. Potting media from infected hanging baskets and other containers should be discarded too. Spores can survive at least one year so it is best to avoid these plants for a year or two. It is suggested begonias could be an alternative. New Guinea impatiens does not seem to be affected. 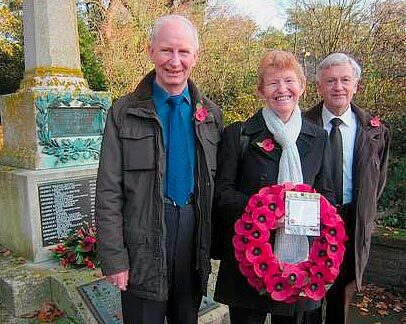 On the 18 November 1940, 30 men of A Company, 6th Battalion of the Kings Own Scottish Borderers were killed in Theydon Bois, when an enemy parachute mine fell on Theydon Bois. Their names are commemorated on a plaque in St. Mary's Church Theydon Bois, Essex. Every year their names are read out along with the 29 men killed in WW1 and the 25 killed in WW11T from the village. This year there was a difference, the children of one of the K.O.S.B. men came from Liverpool came specially to lay a wreath in honour of their father Richard Atkins aged 26 when he was killed. 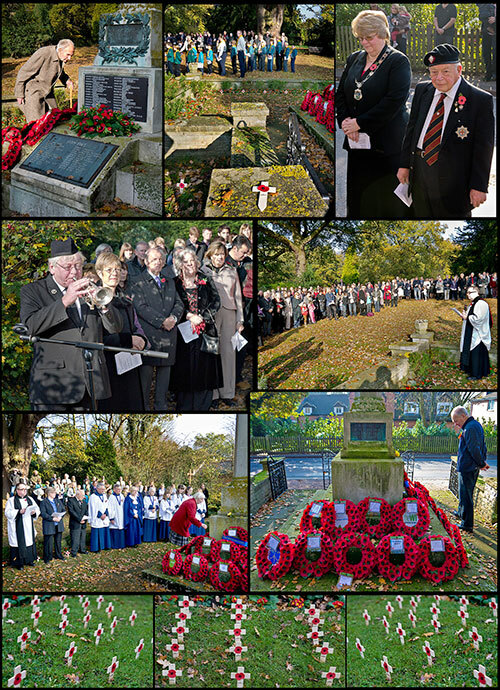 Over 150 attended the wreath laying ceremony and the service afterwards in St. Mary's Church. The Limes now has a new improved Website and very usefully you can now register to renew your repeat prescriptions online. Repeat prescriptions are issued at your doctor's discretion and are normally for patients who are on long term medication. After registering You can login and order your repeat prescription directly through the site and and indicate if you would like to collect it from either the Limes or Theydon Bois Pharmacies. Your prescription or the medicines will then be ready for collection 2 working days later. Our village Voluntary and Community Groups still have the opportunity to apply for funding from "The Big Society Fund Community Capital Award" Scheme. The deadline for Expressions of Interest is Monday 31st October 2011 and completed application forms must be received by Wednesday 30th November 2011. Judging Panels will meet in February 2012 for decisions. If you would like any assistance with completing any forms then please get in touch with Voluntary Action Epping Forest & Rainbow Services. They offer free and impartial funding advice and would be more than happy to help if you need any more information. Members of the Loughton Astronomical Society are holding a meteor watch on 8th October. A rare event may occur – a meteor storm! The usually sedate "Draconids" meteor shower only produces a few shooting stars per hour in most years, but in some years we have a meteor storm, and that’s just what’s predicted for this year. During a meteor storm the Earth passes through a particularly dense clump of comet dust, meaning that rates of shooting stars temporarily spike, and estimates this time suggest the possibility of up to 10 shooting stars per minute during the peak of the storm. As the “Draconids” this year possibly promises to be a major event, the LAS are holding an open evening of meteor watching and general stargazing at the Scout Hall, Loughton Lane, Theydon Bois from 7:30 to 10:30 pm. More details and how to get to the venue may be found at www.las-astro.org.uk There will be displays and exhibitions if the weather is cloudy. Our seniors enjoyed another Friday afternoon in the Village Hall on the 23rd September. 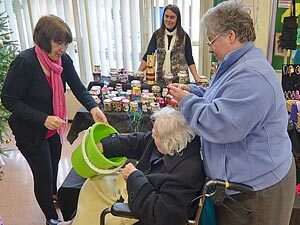 They were able to listen to the excellent Loughton Ladies Choir singing about a "piece of cake" (Spoonful of Sugar - from Mary Poppins) while sampling the homemade tea and cakes made and served by our volunteer helpers. 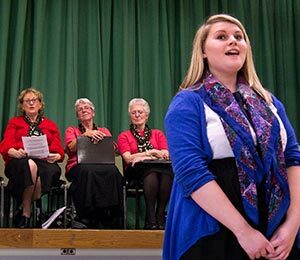 Loughton Ladies Choir gives regular afternoon concerts in the Epping Forest area and can be seen entertaining our seniors in the brief video below. 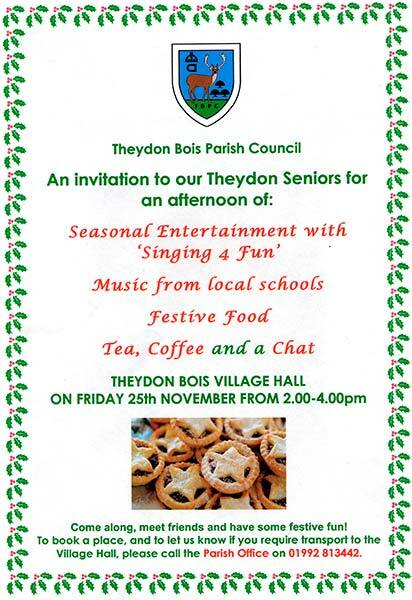 The next Theydon Seniors event will take place on Friday 25th November from 2.00pm - 4.00pm. If you are interested in coming along or helping out as a volunteer at the event then please call Sally Crone, Parish Clerk on 01992 813442 to book your place or e-mail parishclerk@theydon.org.uk. Transport can be arranged if required.